1. I used 4 inch pieces of brass wire to form these shapes. The loop at the top is turned with a slight overlap, and the bottom just has a small hook. 2. 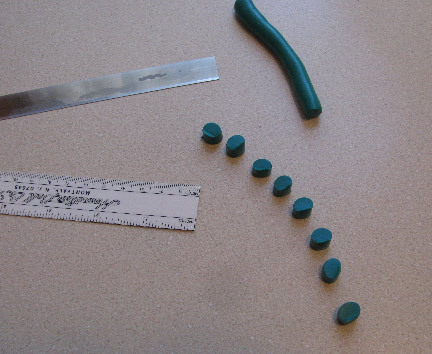 I decided to make all the head pins about the same size, so I rolled out a log of polymer clay and used a ruler to get semi-accurate cuts, not worrying too much about perfection. The color of the clay is not important, but it did turn out that I used a similar color of nail polish. Use whatever color you have scraps of. 3. 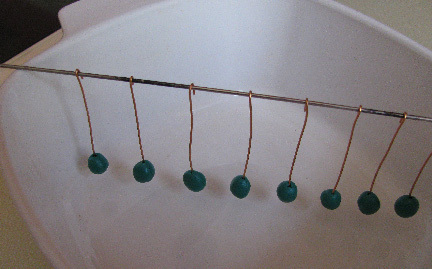 I formed fresh water pearl shapes on each loop and hung the clay to bake according to the manufacturer's direction. When they were fully baked, I left them suspended to paint. 4. Paint first with nail polish (multiple coats may be needed with some brands), and after they have dried, dip them into Future Floor Finish (two coats for mine) to protect the finish. 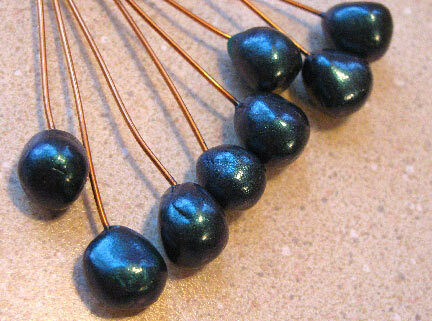 These look a lot like iris peacock pearls in person, and I made half a dozen additional colors as well. What can I say...I've got a lot of nail polish colors! At some point in the future, I'm sure there will be a project that features these! Editor's Note, 06/18/13: Beverle contacted me and said that she'd seen online that you shouldn't use nail polish because it could eventually break down the clay. I found another reference after her message about it sometimes causing clay to get sticky later. But other people had no problems, and still others said it was fine as long as you coated the piece with a sealer (like Future Floor Polish! ), which we've done. Mine are about 3 weeks old now, and they are still just fine. All I can tell you is that different brands may react in different ways, and you should do a test before you sink a ton of time into a project! What a clever idea! 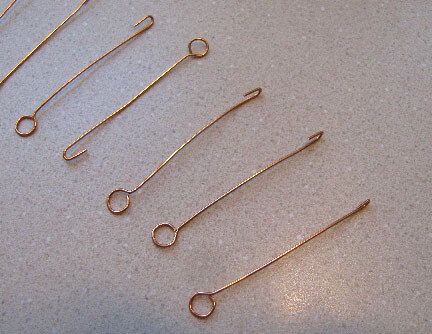 it's so nice to have something different than a same old head pin. This really stirs the imagination. You inspire me to use my newly purchased ute and melting pot!